One of my favorite moments in Arthur C. Clarke's 1953 classic (and still a great read!) Childhood's End occurs when the mysterious alien Overlords request a special exhibit for them to take back to their home planet. They wanted to see the Earth's largest creatures locked in mortal combat. The tableau might have been the work of some mad artist in a drugged delirium. Yet it was a painstaking copy from life: Nature herself was the artist here. The scene was one that, until the perfection of underwater television, few men had ever glimpsed—and even then only for seconds on those rare occasions when the giant antagonists thrashed their way to the surface. These battles were fought in the endless night of the ocean depths, where the sperm whales hunted for their food. 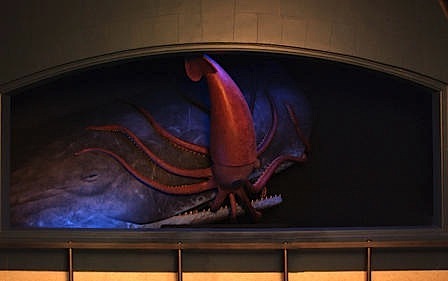 It was food that objected strongly to being eaten alive — The long, saw-toothed lower jaw of the whale was gaping wide, preparing to fasten upon its prey. The creature's head was almost concealed beneath the writhing network of white, pulpy arms with which the giant squid was fighting desperately for life. Livid sucker-marks, twenty centimetres or more in diameter, had mottled the whale's skin where those arms had fastened. One tentacle was already a truncated stump, and there could be no doubt as to the ultimate outcome of the battle. When the two greatest beasts on earth engaged in combat, the whale was always the winner. For all the vast strength of its forest of tentacles, the squid's only hope lay in escaping before that patiently grinding jaw had sawn it to pieces. Its great expressionless eyes, half a metre across, stared at its destroyer—though, in all probability, neither creature could see the other in the darkness of the abyss. Via American Museum of Natural History; special thanks to Eric N. for spotting this story.